Some of the first advocates of women’s rights and the abolition of slavery were two sisters from Charleston, South Carolina, Sarah Grimke (1792-1873) and Angelina Grimke (1805-1879). The Grimke sisters were “raised in the cradle of slavery” and were the daughters of a wealthy plantation owner, Judge John Fauchereaud Grimke. Even though the girls grew up with the privilege and comfort of their aristocratic life, they grew to despise the institutions they were so much a part of: slavery and patriarchal societies that oppress women. As young girls, the sisters taught their slaves to read, something that was highly punishable not only on the plantations, but by law. Sarah accompanied her father to Philadelphia in 1819, and it was there that she encountered the Society of Friends, or Quakers. The Quaker’s view on equality of the sexes and antislavery resonated with Sarah, and she eventually converted to Quakerism, and Angelina later on. The Grimke sisters moved to Philadelphia, and that move gave them the motivation and confidence to know, that as women, they could make a difference and have their voices heard. 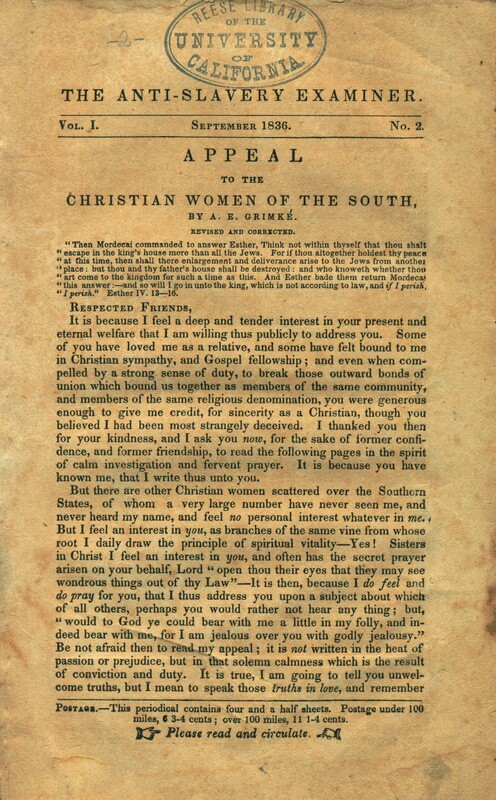 Angelina published a pamphlet called “Appeal to the Christian Women of the South”. This document was directed at Southern, white women, and it was a call to arms to help end the institution of slavery. The pamphlet was burned and criticized in many areas of the South in opposition to the Grimke sisters’ message. Sarah and Angelina began a speaking tour of over 67 cities, mostly in the North, which was “unheard of women of the time… Angelina’s last speech of the tour, to the Massachusetts Legislature, made her the first woman in American history to speak in front of a legislative body”. Sarah and Angelina’s involvement and fervor on the subjects of abolition and women’s right lead to a lot of “condemnation from religious leaders and traditionalists who did not believe that it was a woman’s place to speak in public”. These groundbreaking women helped pave the way for future abolitionist and women’s rights activism. They broke from their privileged, plantation life and linked the struggles of women and slaves in order to create the hope for an equal and progressive future, free of oppression. Wherever you live, you are working and establishing relationships with people, doesn’t matter to which culture you belong, everybody knows simple things like what it is to wake up in the morning and look forward to your day…like human beings. This is the basic issue. Now I belong to the group of legal immigrants that came to the United States. I became part of….I acquired a new culture and way of life of this human society: the United States, a nation rich in diversity and with one of the most fluid, complex and democratic culture in the world. 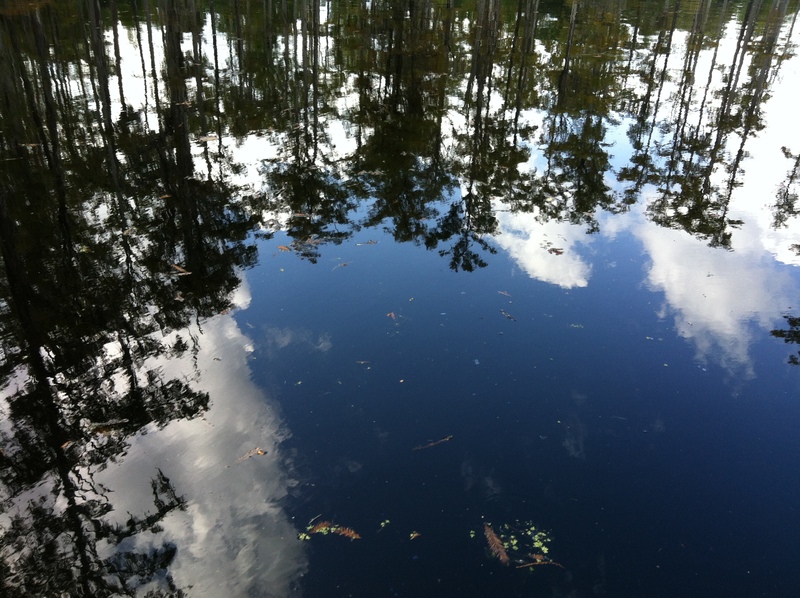 My challenge is not only to recognize the cultural practices, also to change many of my own. I want to be able to effectively function and communicate with this culture. To start a new life includes learning about the job market and competition, knowing about the economy of the country and, in this case, the United Sates is a country with abundant natural resources, a well- developed infrastructure, and high productivity. But when you think about what an ideal community would look like, you are faced with reality. Societies around the world are growing at different rates, unequal, which is one of the biggest social, economic and political challenges of our time, and the United States is no exception. Diminishing inequality will reduce poverty. Inequality differs widely around the planet and the definitions of the poverty line may vary significantly among nations. An example of this is the United States, a rich country applying “generous” standards of poverty versus Colombia in South America, my mother’s country. Poverty defined “as an economic condition of lacking both money and basic necessities needed to successfully live, such as food, water, education, healthcare, and shelter”([i]). To make a comparison between these both nations, I selected the perspective of the population living below the national poverty line by The World Fact book. The poverty line is the minimum level of income deemed adequate in a given country. As I mentioned the poverty line is significantly higher in developed countries than in developing countries ([ii]). For example, in the 48 contiguous states and the District of Columbia a family of 4 people and with a Household annual Income of $23,550 is considered Poverty. A worker that earns the minimum wage per month in Colombia- South America will receive monthly a total of $660 thousand pesos, with an exchange rate per dollar of $1.919,54 pesos, in dollars is an amount of $343.83 dollars and the situation could be that only one person works at home. If we analyze local data, in Charleston County, 16.8% of the population is below poverty level and the unemployment rate 8.1 %. ( United States Census of Bureau). However population can change due to births, deaths or migration and this last one is very difficult to estimate especially since many of them are in an illegal situation. For this reason, the problem could be worst and “be under the rug”. The goal is to have a prosperous and competitive economy in our County and in order to progress and to compete. South Carolina needs to be culturally competent with international educational standards, especially in language standards, ready for a global economy. Education is a condition for building and supporting a strong economy that delivers higher wages and higher profits. As a seaport Charleston is connected to the world. 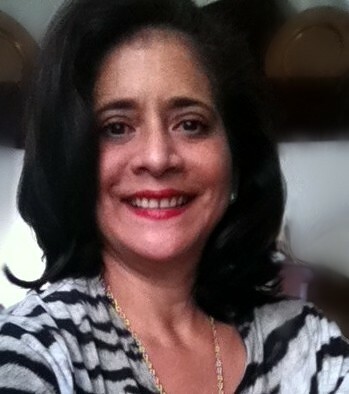 Lupe Barragan-Moser is a BA Communications with a MBA- Development projects with 15+ years of experience in the areas of Internal/External Communications and projects manager in the non profit sector. She’s a mother of two children 22 and 27 years old, the smallest in the family of three sisters and still has her mother alive. She grew up in a women sight world in Barranquilla, Colombia. She shares her life of the last 4 years with her husband. Love was the reason to come to life in Charleston and she enjoys it tremendously … river, sea , sun and beautiful smiling face people. [ii] Hagenaars, Aldi & de Vos, Klaas The Definition and Measurement of Poverty. Journal of Human Resources, 1988)(Hagenaars, Aldi & van Praag, Bernard A Synthesis of Poverty Line Definitions. Review of Income and Wealth, 1985. Have you reached a road block in your career or small business? Is it time to reach out for new ideas and new contacts? Are you balancing your work and family and stretched for time? As a working woman, the South Carolina Women’s Business Center and the Center for Women can help you be more successful. Women are starting their own businesses at unprecedented rates. Between 1997 and 2011, women owned firms in South Carolina increased 64% and that’s compared to the national average of 50%. Women have great business ideas and know what women want to buy. Women control 80% of all discretionary spending and women are inventing new products and services that better match their needs and expectations. Each month, the South Carolina Women’s Business Center holds an Entrepreneurial Readiness workshop where women can learn about the key ingredients that go into being a successful business owner and understanding the steps necessary to launch a viable business. The Entrepreneurial Readiness workshop is a great starting place for any woman who has a business idea to get a solid grounding before embarking on her new venture. Additional programs include a monthly networking session where women can learn and support each other and a development workshop on specific topics such as commercial insurance, legal structures for business and human resource policy. To learn more, visit www.scwbc.net. The South Carolina Women’s Business Center has strong community support. Our 2012 Business Partners are Eckert Insurance, First Federal, Merrill Lynch, SC Biz News and Weightwatchers. The South Carolina Women’s Business Center is supported in part by grants from Bank of America, Wells Fargo and the US Small Business Association. For women who work in business and industry and want to increase their chances for advancement, the Center for Women created the Women’s Leadership Institute. Monthly Saturday programs are held on topics that prepare women for stepping into greater leadership roles and higher management. Topics this year have included: Leading with Strength and Confidence, How to Use Persuasion and Create Influence, Handling Promotions with Poise, Using Polarity Thinking for Enlightened Leadership, Networking with a Purpose, Working Well with Difficult People, Getting Comfortable Negotiating What You Want, Delegating Effectively, and Communicating with Impact. The Women’s Leadership Institute is honored to be supported and sponsored by BlueCross BlueShield of South Carolina, Care for Life, Ms. Rose’s Restaurant, Fork Fine Gourmet and Skirt! Magazine. To learn more, visit www.c4women.org. Ginger Rosenberg is the Marketing & Program Manager at the Center for Women. She can be reached at ginger@c4women.org.